This is one (there were several), of the pre-1936 Zeppelin Officers Cap Badges, which of course was worn during the Nazi (NSDAP) period but before the badge was changed to the Eagle badge below. It is taken from an original and has appropriate markings on the rear and is made in the correct metals and enamel. 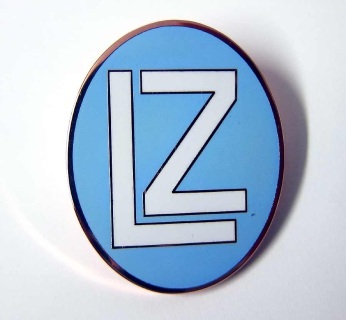 'LZ' stands for Luftschiff Zeppelin, or "Airship Zeppelin". This badge has been seen on crew pictures from the early 1930's to approx 1935. This one is in aged condition and is rarer than the eagle badge, no two badges will be the same due to the ageing process, just like original badges. This is the rear of the airship LZ (Luftschiffbau Zeppelin - Zeppelin Company works), Zeppelin Officers badge. It is marked with the manufacturers name and model number and is made from copper metal. It has a lovely aged patina as you can see from the pictures. Each one is individually aged so no two will be alike. 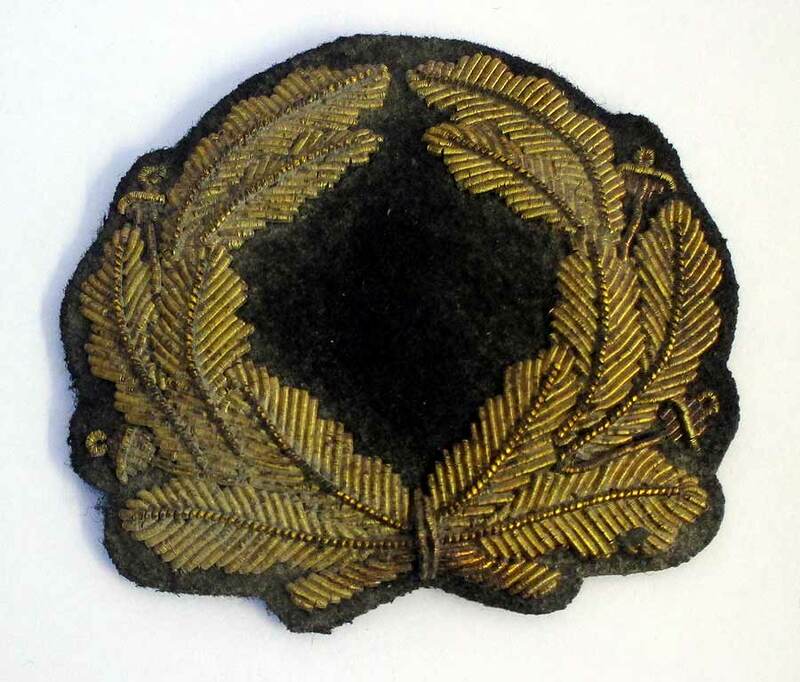 Reproduction German Nazi period (pre - 1936), Zeppelin Officers Cap Wreath in aged condition. If you want to make up a Zeppelin Officers cap prior to 1936 and in aged condition this is the wreath to get. 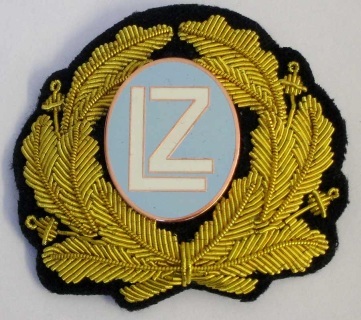 This wreath is the one worn with the Zeppelin 'LZ' badge mounted in the centre. This is the same reproduction LZ airship cap badge as the aged one above but this one is in new condition. It is made from copper plate on base metal. It is a lovely solid badge and is an excellent collectors piece as genuine LZ Badges are extremely rare. 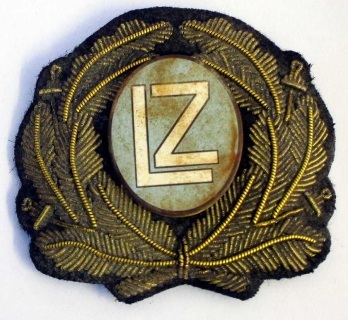 Reproduction German Nazi period (pre - 1936), Zeppelin Officers Hat Wreath & 'LZ' badge. It is perfect if you want to make up a Zeppelin Officers cap for this period. In aged condition. Each wreath and badge is aged individually giving a totally unique badge & wreath combination. The badge is not mounted on the wreath to allow you to adjust the placement. Reproduction German Nazi period (pre - 1936), Zeppelin Officers Cap Wreath & 'LZ' badge. It is perfect if you want to make up a Zeppelin Officers cap for this period. The badge is not mounted on the wreath to allow you to adjust the placement. This is the ultimate item for Zeppelin collectors. 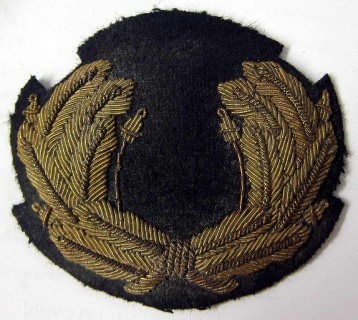 It is a reproduction official badge worn by the officers of the Zeppelin crews from 1936 to 1940 approx. a very short time span. Worn by Kaptains and other officers of the Zeppelins namely Hindenburg and Graf Zeppelin. 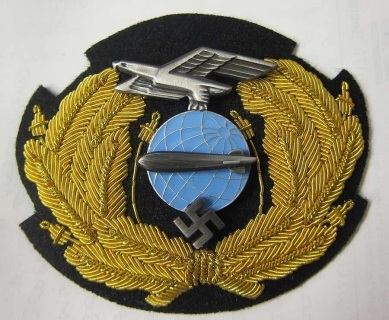 This badge in original form is impossible to collect - they are extremely rare . We are without a doubt the only web site where you can buy such a reproduction period treasure. It is extremely rare! The Zeppelin transport company or DZR - Deutsche Zeppelin Reederei - was established on March 22, 1935 to operate German passenger airships. The DZR was created at the instigation of Air Minister Hermann Wilhelm Goring in order to control Zeppelin operations and can be seen as part of the larger policy of Gleichschaltung which affected all aspects of German company policies in the years following Adolf Hitler’s assumption of power. We have made up this badge from a known silver plated original. 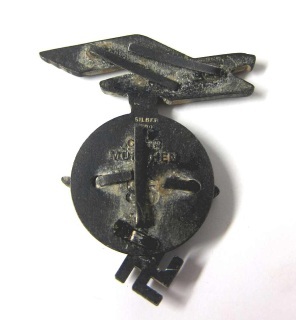 It has all the makers markings on the reverse and all the correct attachments and details. You will not find a better reproduction. Each one has been aged individually so no two will be alike, adding to its value. 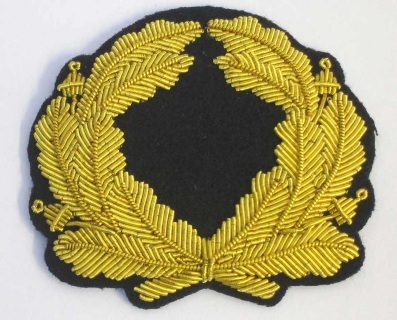 Buy the officers wreath, add the badge and hey presto you have two beautiful items married as they should be. Months of research and development have gone into producing this airship badge. 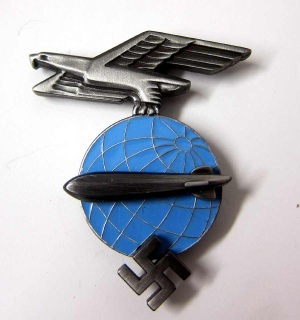 This is the rear of the airship Zeppelin badge. It is marked with the manufacturers name and 800 silver mark (our reproduction is not silver as it would be over £100 to manufacture), but it has an aged silver patina as you can see from the pictures. 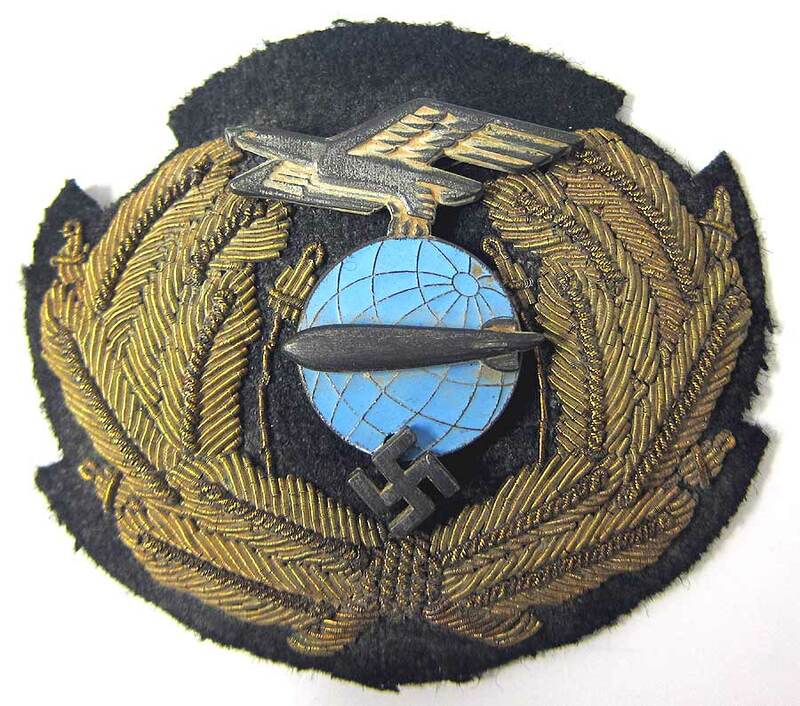 This is a hand made badge and reproduction German Nazi period (1936 to 1937) Zeppelin Officers Cap Wreath, aged to lo0k 70+ years old. It is perfect if you want to make up an aged Zeppelin Officers cap. 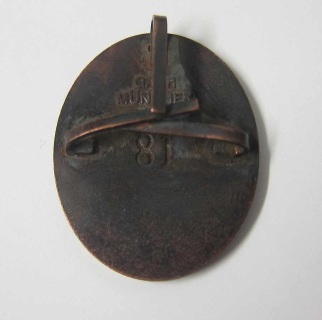 This is the same airship cap badge as the aged one above but this one is in new condition. We can also remove the Swastica so that countries where this symbol is banned can also purchase it. It is made from imitation silver plate on base metal the attachment prongs are made from brass. It is a lovely solid and chunky badge. It will look fantastic mounted on the officers hat wreath which we are selling below. This is a hand made badge and reproduction German Nazi period (1936 to 1937) Zeppelin Officers Cap Wreath and Badge, in new condition. It is perfect if you want to make up an aged Zeppelin Officers cap. The badge is not mounted on the wreath to allow you to adjust the placement. 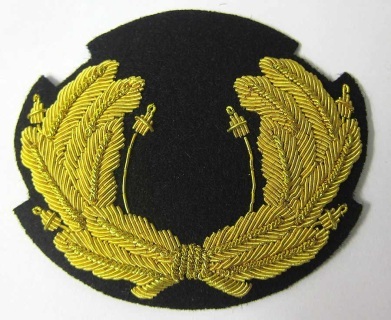 If you don't see a German badge suitable for your helmet or hat and want one made up, please email us the details. We may be able to make it for you. Please be aware we only make historically accurate helmet & hat parts.